This weekend it was teething festival here in Angel Land. Not only did my little niece S cut her first two teeth while visiting, but JSL was also hard at work. Friday night into Saturday two tiny points of his upper one year molars finally showed their face. Sunday into Monday JSL was up most of the night. Yesterday he had a low grade fever and sure enough I believe molar four has now graced us. He has been working on these suckers for quite some time. Hopefully having them cut will relieve the pressure. Now I just hope that the fever is gone because it always makes me nervous with him after our adventure and hospital stay in February. Obviously I have no photos of the teeth, but I am including more attempts at photos of the three cousins from the weekend. Many of you may recall my Mission Impossible post from earlier in the month. Please note these are also to keep Nana happy since she checks in here! 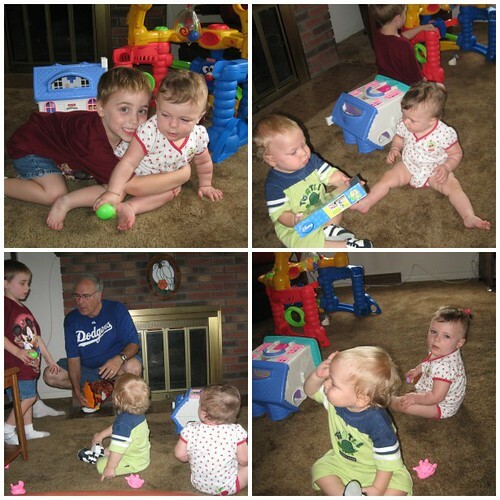 Both of the boys love their little cousin S. NHL and JSL enjoyed showing her all of the new toys at Nana and Papa’s house. Watching JSL and S play was too funny. 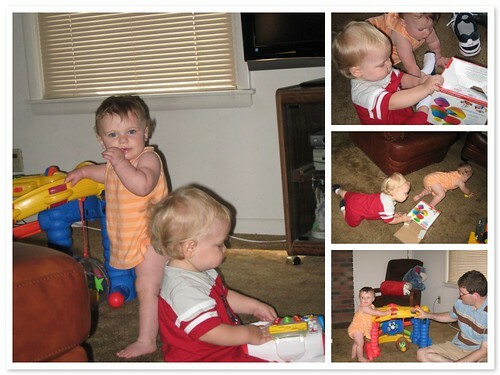 They played follow the leader often, and would get into baby spats over toys. JSL was usually a gentleman and gave his little cousin what she wanted. Sunday morning before going home S gave all of us a big scare. She had egg yolk for the first time and had a horrible allergic reaction. Thankfully after some antihistamine you would never know that she had anything happen. It was quite scarry for all of us here, and especially for Aunt M who was away. While we watched to make sure the medicine worked the kids played. 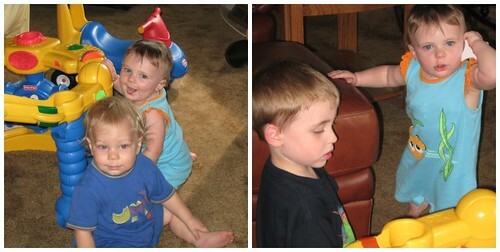 Nana had to work during the day and requested once again a photo of all three of the kids. As you know from the previously mentioned Mission Impossible, this is no easy task. Here I present all of the kids together in one way or another. 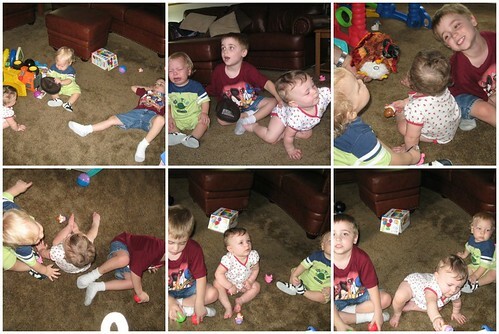 BTW – the program I used to make the collage chopped the parts off, so this was not the best view of these photos. Cousin S loved to show everyone she was "So Big" and JSL loved to laugh and dance for the turkey that Papa had. All was good in the land of teething kids. The best thing that happened this weekend. I now know what to get my sweet little niece for her first birthday. She loved the Fisher Price Little People, so I have already told everyone that we are getting her some of those. I hear you on the teething – Zach cut two while staying with my parents, though fortunately my mom said he showed no signs whatsoever. Your niece is so cute, she fits right in with her cousins!